100% Organic & FDA Registered. Get our 33ml Value Size an save 26%! Often caused by pregnancy and weight gain or loss, stretch marks generally appear on the abdomen, hips and buttocks and resist the best efforts of a healthy diet and exercise program. Likewise, many lotions and ointments designed to target stretch marks contain toxic ingredients that are readily absorbed into the bloodstream. In fact, many skin lotions contain pesticides that are harmful for the skin and the environment. Certified organic rose hip seed oil from Chile further supports healing, regeneration and beautiful skin. Homeopathic Silicea, potencized to six times its regular strength to help improve overall skin health. Finally, calendula also promotes healing and is very safe and effective for first aid or chronic conditions. The proprietary formula for Stretch Marks Beauty Balm was developed by the Forces of Nature medical team, including a naturopathic doctor and a staff biologist specializing in plant medicine. Forces of Nature’s mission is to provide innovative natural medicines which deliver results to bring healing to the world. Like all of Forces of Nature’s organic products, Stretch Marks Beauty Balm comes backed by a one-year, money-back guarantee. 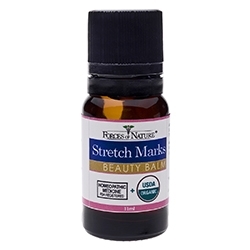 Safely remove stretch marks with the use of Stretch Marks Beauty Balm from Forces of Nature. Thiosinaminum* 8C - To heal stretch marks and damaged skin and dissolve scar tissue and adhesions. Used to treat stretch marks. To help prevent stretch marks massage this product into potentially problematic areas (stomach and buttocks) during pregnancy up to one month before delivery date. Smaller or newer stretch marks treated 3 times per day for just a few weeks will almost always heal without complications. For treatment of older or larger stretch marks, application may be required over a period of 1-3 months for remission. For external use only. Avoid contact with the eyes; if contact occurs, flush with water and seek advice from medical personnel. If condition worsens or does not improve after regular use of product as directed, consult a doctor. Do not apply to wounds or damaged skin, use for prolonged periods, or use over raw surfaces or blistered areas without consulting a doctor. Some individuals may be sensitive to tea tree or other oils. If you are pregnant or breast-feeding, ask a health professional before use. Not to be used with children under 2 years of age without physician direction. Keep all medicines out of the reach of children.